​There is a Low Income Home Energy Assistance Program (LIHEAP) to help qualifying individuals and families who are experiencing difficulty paying their heating bills. For example, a family of four that earns $37,650 can qualify for assistance. 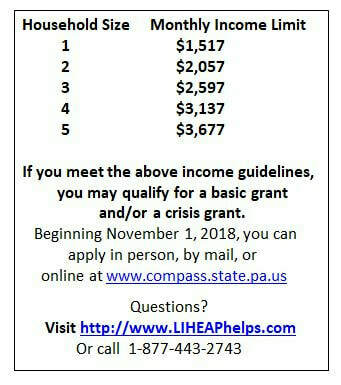 The PA Department of Human Services administers LIHEAP funds. Individuals or families can be considered if an application is received before April 12, 2019. Crisis LIHEAP funds are also available to qualified customers who may be experiencing a heating emergency. The Warren Pennsylvania Fraternal Order of Eagles, #313 is happy to be in a position to once again award a One Thousand Dollar Scholarship to six Warren County students. This scholarship is open to all Warren County students, whether they are just graduating from high school, returning to higher education after a hiatus, or whatever the life situation may be. Our top requirement is that the student must be a proven Warren County PA resident enrolled in or been accepted into a certificate, degree, or technical program at the time of application. Applications are available at the Youngsville Public Library circulation desk or may be downloaded (word doc link below). Note: This application MAY NOT be changed in any way. Any application changed in wording, original content or format will be disqualified.